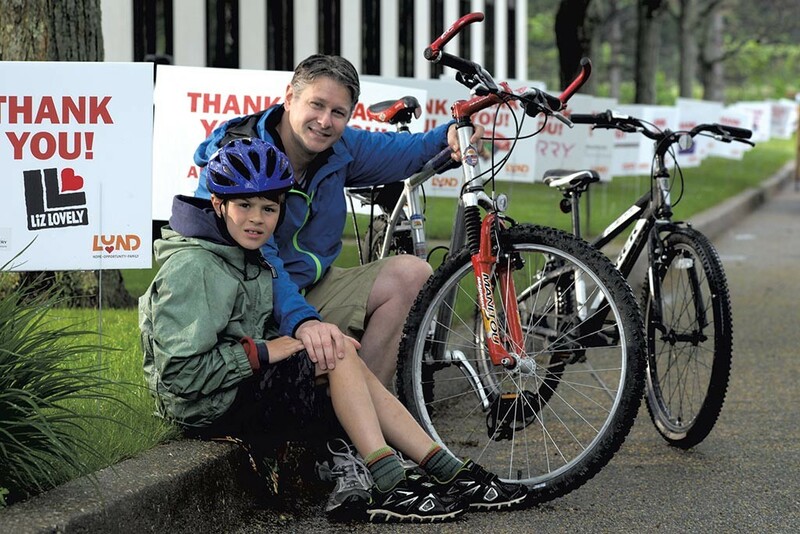 A week ago Sunday, Chris Curtis climbed aboard his mountain bike — an aging "Al Gore for president" sticker affixed to the crossbar — and headed out on the Lund Ride and Walk for Children with his 8-year-old son, Will, following on his own bike. Even in a steady rain, Curtis was not going to miss this event. A member of Lund's board of trustees, he had met his $2,000 fundraising goal the night before. But there was another, more personal, reason motivating him. Forty-six years ago, he was Baby Boy No. 4656 adopted from Lund. He keeps the $600 receipt in a box at home. His parents got a pretty good deal, he said jokingly. Curtis did, too. "I feel like I won the lottery," he said of the unusual family that adopted him in 1970. "I figure I got my first second chance very early in life." On the wall of his Vermont Legal Aid office in Montpelier are two photos of his adoptive father. The late David W. Curtis — lawyer, one-term state legislator, defender general and Vermont Democratic Party chair — was widely revered as a champion of the disadvantaged. He died in 1999 at age 61 of complications from AIDS. The Vermont Democratic Party will honor him Friday night at the 17th annual David W. Curtis Leadership Awards dinner. Chris Curtis tries to honor his father's legacy every day by carrying on his work. But it took time to find the way. After graduating from Champlain Valley Union High School in 1988, he spent eight years at the University of Vermont. Then he traveled the globe, hiking the hills of South Korea, teaching in the Dominican Republic and living and working on the West Coast — where he met his wife, Abby White. Curtis was 33 and "pretty focused" when he came back east to enroll at Vermont Law School. The Legal Aid lawyer and cochair of the Governor's Council on Pathways from Poverty has since established himself as a plucky, persistent and almost unfailingly pleasant advocate for the poor — in court, the Statehouse and state government. "My clients are very, very smart, very resilient. The system is often stacked up against them," Curtis said. "It's my job to help them tell their story." When a Barre woman's water was turned off because her landlord didn't pay the bill, Curtis won a court ruling in 2012 that determined that such shutoff policies are unconstitutional. He then persuaded lawmakers to bar all Vermont municipal water systems from repeating Barre's mistake. Though he has never held state office, Curtis has had a hand in many of the key policy changes made on behalf of low-income Vermonters in recent years: fighting budget cuts to social services; giving those with suspended driver's licenses a chance to get them back; and limiting how much rent-to-own stores may charge customers. Dressed typically in khakis, scuffed brown shoes and timeless sport jackets that set him apart from higher-paid lawyers and lobbyists who often surround him, Curtis navigates his way through the halls of power. "He gets you to say yes," said T.J. Donovan, the Chittenden County state's attorney with whom Curtis has worked on criminal justice policy. "He's just got a great way about him. He's disarming. He doesn't preach to you." Curtis credits his adoptive parents with good direction. His mother, Nanci-Ames Curtis, said she and his father knew after having a child of their own — Chris' older brother, Curt — that they wanted to adopt two kids. It was the late 1960s and the couple was conscious of overpopulation, she said. First they adopted a girl, Jill, from Lund. They took in newborn Chris nearly two years later, in 1970. "From the second they put this baby in my arms, he has been a joy," said his mother, still a practicing psychiatrist at age 77. Curtis said he knows nothing about his birth family, and, like any adoptee, he wonders. "I've always respected the decision of my birth parents to make that difficult decision," he said. "It certainly was the right decision for me." That's not to say his adoptive family was typical: His parents divorced in 1978, when Chris was 8, and his mother and father later both came out as gay. For Curtis, the turn of events never felt traumatic. "We learned about resiliency, acceptance, trying to meet people in their own place," he said. David still had an R next to his name when he represented Charlotte in the state House for a term starting in 1975. But after an unsuccessful run for state attorney general in 1976, he switched parties and headed left. In 1980, David moved to rural Tennessee and then South Dakota to advocate for the poor. Son Chris spent summers with his father. He recalls watching from an upstairs window in Columbia, Tenn., while his father stood on the street silently protesting a passing Ku Klux Klan march. Nanci-Ames said father and son got very close during that period — especially when David had a heart attack in Tennessee one summer. She said Chris, then 10 or 11, refused to come home until his father was well enough to travel. "I think it was a huge bonding moment with his father that never went away," she said. When he returned to Vermont full time in 1985, David served two years as state defender general, and then was a private-practice lawyer. In 1991, he learned he was HIV-positive and eventually went public to advocate for others who were battling AIDS before succumbing to the disease himself. With Chris as his campaign manager, he ran in 1996 for state Senate. He openly acknowledged his illness to voters, but fell just short of victory. "Dad was essentially a failed politician," is how Chris Curtis summed it up, "yet he wielded a lot of influence." "He was a lawyer who really cared about his clients," said Rich Cassidy, a former law partner. "He was a cacophony of personages — a lawyer, an activist, a reformer, a civil rights leader, a mentor, a gay man, a feminist, and a father," Curtis said. "And he was funny. Anyone will tell you he had a wonderful sense of the absurd." Nanci-Ames Curtis has also been a big influence on her son. A women's rights activist who now lives in Maine with her wife, she took Chris and his siblings to live for a year in Tanzania when he was 6. His father chose to stay in Vermont and run for attorney general, visiting the family at Christmas. Curtis hasn't forgotten the experience of trying to learn numbers in Swahili in a dirt-floor Dar es Salaam school. Classmates kept touching his straight blond hair, assuming it couldn't be real. "I was very fortunate to have had that opportunity," he said. En route, the family slept on the beach in Normandy, visited the pyramids and dodged a charging rhinoceros in the Serengeti. The takeaway from his time in Africa is classic Curtis: "that the world is a very big place, indeed, and that it does not revolve around the worldview of one little boy from Vermont." The world traveler eventually realized there was no place he'd rather be than in Vermont, fighting for the underprivileged, as his father had done before him. When he applied as a newly minted lawyer for a job at Vermont Legal Aid, Curtis didn't have the usual required experience, said his boss, Eric Avildsen. But "he did have the passion I look for," he said. A decade later, Avildsen hasn't been disappointed. Curtis has an unusual ability to identify patterns of problems that low-income clients face — and to come up with solutions that benefit many. One example started as a conversation over coffee with Donovan at a Burlington café last year. Curtis urged the prosecutor to offer amnesty to drivers whose licenses have been suspended for overdue civil fines. Donovan jumped at the idea, launching a one-day driver-restoration event. Hundreds of people lined up, looking for a second chance. "I credit Chris with the vision," Donovan said. Curtis also helped manage the unexpectedly large crowd. "Chris knew a lot of them," Donovan said. "It was a lengthy wait. He kept it light." Curtis then took the concept to the legislature, which this year voted to offer the restoration program to drivers statewide. Does he think about running for office himself? Curtis is convinced that, just like Dad, he can do more good for low-income Vermonters as their lawyer. "I went to law school so I could practice law and help individuals," Curtis said. "In some ways I have more freedom than a person might who pursues a political path." That doesn't stop people from urging Curtis to run. "I tell him all the time," said Donovan, a Democratic candidate for attorney general this year. "Chris could be attorney general; he could be senator; he could be governor. The guy's got talent." There's another reason Curtis cites for not pursuing politics. His wife works in Burlington, so it's his job to pick up their sons at school in Montpelier and take them to little league and soccer. After the Lund bike ride, Curtis left in a hurry. Baby Boy No. 4656, the adopted child of David and Nanci-Ames, had to pick up balloons on the way home for son Noah's fifth birthday party. *Correction, June 15, 2016: An earlier version of this story contained inaccurate information about David Curtis' legal milestone.